Why Is Protecting Your PC’s BIOS Important? HP Sure Start - Why Is Protecting Your PC’s BIOS Important? The possibility of the BIOS of a PC being compromised by a hacker poses a potentially grave threat, as the BIOS plays a crucial role in the functioning of a PC. Without properly functioning BIOS, your computer may not be able to start at all. However, a feature like HP Sure Start is an ideal option to protect this most crucial aspect of an operating system. HP business performance notebooks were created to be the most secure that the industry has ever seen. In addition, HP BIOS protection meets and exceeds NIST standards, as does the entire HP security client suite. A BIOS scanning aspect of HP security software called HP Sure Start ensures that your device runs properly upon boot up each and every time. The BIOS is a blueprint for booting up a computer. It initiates firmware while loading critical hardware components. HP Sure Start technology works constantly, without user intervention, making sure that there are no compromised BIOS files that have taken root in the device. If a corrupt version of the BIOS does wind up being detected, the device automatically restarts using a clean copy of the BIOS. This is an incredibly efficient and truly remarkable method of protecting your PC’s BIOS. This way, threats can be prevented before they ever take root in the first place. Instead of detecting a threat in a passive way which then requires user intervention, HP Sure Start ensures that your PC is running a clean and secure BIOS every single time you turn your PC on. Which security features are available on HP performance business notebooks? The HP EliteBook comes with HP security services like HP BIOS protection. In fact, HP client security suite, which includes HP Sure Start BIOS protection, was created with the express purpose of giving HP EliteBook business PC customers the ultimate line of defense against BIOS-threatening malware and attacks. All of these features add up to a much more convenient and comprehensive security solution than any other company has devised to-date. The National Institute of Standards and Technology (NIST) sets standards for NIST cybersecurity. HP client security covers the five basic elements of NIST standards. These include protection, identification, detection, response, and recovery. NIST security provides a guideline that can be followed to ensure comprehensive protection from cyber threats. NIST cybersecurity standards are a set of rules that users can adhere to so they can stay protected. 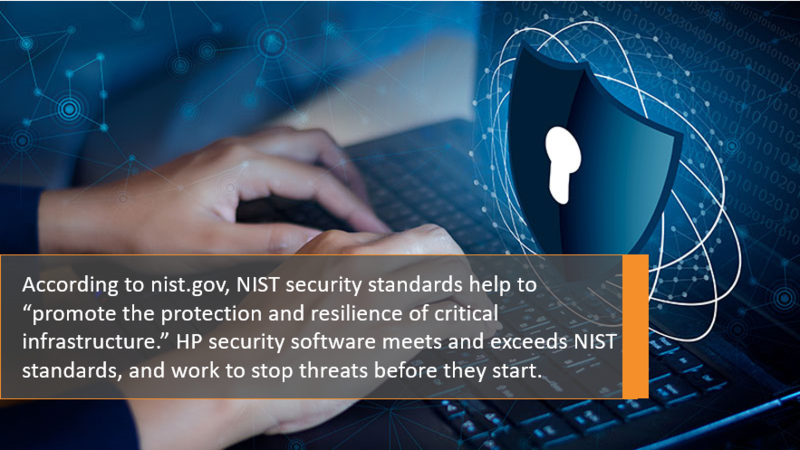 According to nist.gov, NIST security standards help to “promote the protection and resilience of critical infrastructure.” HP security software meets and exceeds NIST standards, and work to stop threats before they start. You don’t have to worry about meeting government standards if your laptop or PC is an HP Elitebook. The Elitebook lineup comes with Sure Start included, and have BIOS security built-in. Want to learn more about the HP security features that are right for you? Contact us at ABM Federal today!